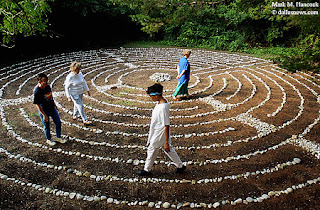 Barbara Kalley (from left to right), Peggy Hookey, Dee Lewis, and Sally Jones walk an outdoor labyrinth at the Unitarian Universalist Church of Oak Cliff on Sunday, June 22, 2003. The labyrinth is an 11 circuit design modeled on one in the Chartres Cathedral in France. The public is welcome to walk the pattern, and it is always open. Officer Chris Huski (right) of the Grand Prairie Police Department warns Dustin Manning (left) and Eric Legrand (center) of St. Louis, Mo. about their personal water craft behavior during lake patrol on Joe Pool Lake on Saturday, June 14, 2003. The police patrol is responsible for the safety and security of water surface and the lake parks of Joe Pool Lake recreational area. 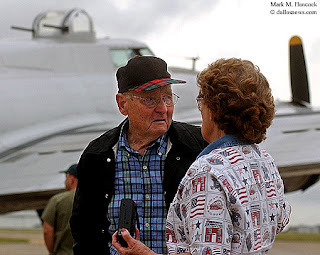 WW II veteran Hubert Carpenter of Pittsburg, Texas is overwhelmed with emotion after a flight in a B-17 Flying Fortress at Arlington Municipal Airport in Arlington on Sunday, June 8, 2003. His wife Pat Carpenter (right) was on hand to share the moment. It was the first time Carpenter flew in a B-17 bomber since his was shot down over Germany.